I know that you’re excited to get your new iPhone 5 and you can be sure we are as excited to sell it to you. 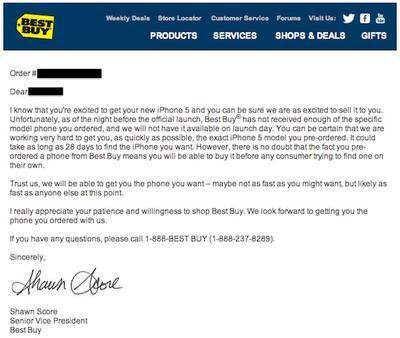 Unfortunately, as of the night before the official launch, Best Buy® has not received enough of the specific model phone you ordered, and we will not have it available on launch day. You can be certain that we are working very hard to get you, as quickly as possible, the exact iPhone 5 model you pre-ordered. It could take as long as 28 days to find the iPhone you want. However, there is no doubt that the fact you pre-ordered a phone from Best Buy means you will be able to buy it before any consumer trying to find one on their own. Trust us, we will be able to get you the phone you want – maybe not as fast as you might want, but likely as fast as anyone else at this point. I really appreciate your patience and willingness to shop Best Buy. We look forward to getting you the phone you ordered with us. Thank you for your recent iPhone 5 reservation. You may have seen some news reports today regarding shipment delays from Apple for the iPhone 5 launch. Unfortunately, this includes some of the anticipated shipment to our Clubs, resulting in reduced initial quantities of iPhones available. Reserved iPhones are anticipated to arrive approximately 7 to 10 business days from the original September 21 release date. A Club associate will be contacting you to reschedule your pickup date and time when we receive your phone at the Club. We apologize for the inconvenience. Alas, carriers are also already beginning to report shortages. Sprint recently said it’s “seriously constrained” or sold out of the iPhone 5 in many of its East Coast locations.